Welcome Ranch; Our Boston Puppies! Boston puppies are, in short, irresistable. I mean cute with a capital C. It is a delight (and an immense amount of work!) 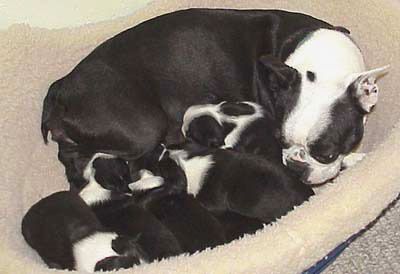 for us to produce several litters a year. We get a lot of requests for our puppies; keeping up with the correspondence can be a challenge! Most of our pups are reserved in advance. If you are interested in a Welcome Ranch puppy, we advise you think ahead, be patient and persistant and email us regularily for a puppy update. We screen our prospective puppy parents - afterall, you are joining our family. 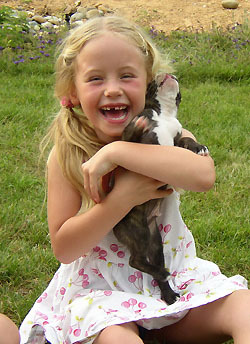 No, you don't need a copy of your tax returns or grade school report cards, just a smile and a sincere love of animals. So plan on a visit before we have a litter available. Then you get to meet all our dogs and get a free face washing too. We encourage you to come spend some time at the ranch (by appointment only). We hold an open house about once monthly to entertain our animal friends. Make a weekend of it. See our webpage on Planning a Visit to see what other enticements Mendocino county has to offer. Remember, wear some sturdy, comfy clothing (stain resistant please) and be prepared for Boston Mania! The coffee pot is on and I'll even bake cookies if I'm feeling really domestic! (don't necessarily count on the latter). If you live too far from us to make a preliminary visit, you can still be a puppy parent by corresponding with us consistently and conscientiously. But be advised, we do not ship our puppies. We care too much. Would you put a human infant in a box and leave it to the whim of some baggage handlers? Consequently, if you live some distance away you will still have to come to the ranch to pick up your new family member. The cost is actually quite reasonable; you can get amazing airline fares in advance and a one way puppy ticket is around 80 dollars. The pup will fly, quite comfortably, in a bag at your feet (we suggest something like the Sherpa bags). Make sure the airline takes pets; not all of them do. On rare occassions we have delivered our pups by air across the country. Mike, because he looks like such a terrorist (NOT! ), was taken aside to have the metal detector wand waved over his body. We still recall the bizarre image of him being electronically frisked, his arms extended, a pup in each hand. The waiting line erupted in gales of laughter. We breed for cheerful,vigorous pups that mature at 12 to 25 pounds or so. Prices range from $650 to $1,000. When you buy a Boston from us, you are joining our extended family. We want to see you and the puppy have a lifetime of happiness and health. All of our puppies come with a comprehensive care package. First, they will have all required vaccines and wormings up to the time they leave. If you live close by, we will finish the entire puppy vaccine series at no cost. All puppies are microchipped; this tiny device implanted under the skin provides the puppy with a permanent identification should it ever be lost or stolen. Puppies go home with a couple of months of heartworm,flea and tick prevention, a toy impregnated with their mother's scent, a bag of our puppy diet and an information package. Most importantly, our pups are not only guaranteed against congenital/hereditary defects, we also provide ongoing veterinary advice/guidance for the life of your pet. Many of our owners return to us for future services, such as spay/neutering, performed at quite reasonable fees. You can download a copy of our puppy contract using Adobe Acrobat by clicking on the Contract link. We strive for happy dogs and happy people.